1. 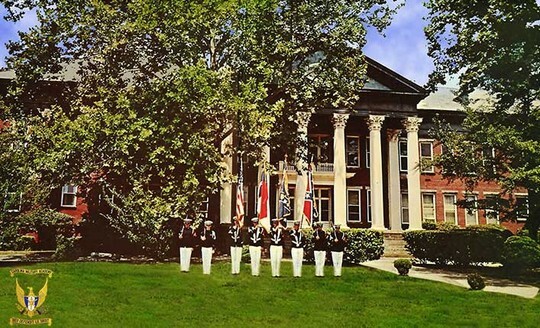 Carolina Military Academy (CMA) was the last of three educational facilities located on the Maxton, NC campus. The first, Carolina College operated there between the years 1912 and 1926. 2. Presbyterian Junior College (PJC) opened its doors in September, 1929. The Civil Aeronautics Authority selected PJC as a civilian pilot training unit in 1939 as global interests began to flair. This was soon changed into a war training service as our nation moved to a war footing. PJC was one of two training facilities in the southeast and instructed over 750 trainees between 1939 and 1943. After the war, the school returned to its’ original operation in which many returning servicemen came as students. The college enrollment surged to over 500 of which approximately 370 were former servicemen. PJC remained an operational college until the early 1960s when the college merged with Flora McDonald College in Red Springs to form St Andrews Presbyterian College in Laurinburg, NC. 3. Carolina Military Academy (CMA), a preparatory school for boys founded by Col. Leslie C. Blankinship, was the final school to make its’ home at the Maxton site. Col Blankinship, a native of Virginia, grew up in Buckingham County and upon graduation from Clifton Forge High School, he attended and graduated with a bachelors degree from Lynchburg College. He then taught and coached at Randolph-Macon Military Academy in Front Royal, VA. He served on the Virginia National Guard for 14 years, having been on active duty with the Army of the United States for six years. He received a masters degree from the University of Virginia in Education and English. He was director of physical education at the YMCA in Roanoke and Lynchburg, VA; and general secretary of the YMCA at Paris, KY and Daytona Beach, Florida. He then held the position of President of Millersburg Military Institute, Millersburg, KY from 1953 to 1962. While there, he tripled the attendance, expanded the athletic and the school’s band programs. In 1962, Col Blankinship became founder and president of Carolina Military Academy in Maxton, NC. 4. During the summer of 1962, Col Blankinship oversaw a considerable effort to get the facilities ready for a school opening in September of that year. He allowed a small cadre of eight students, most with military school experience, to come to Maxton that July to work along with the maintenance crew and school staff to make the facility ready for full operation in September. Don Campbell, Frank Longano, Art Smith, Billy Lewis, Mike Partridge, Mike Keeney, Roddy McNeil, and Scott Blankinship worked along side Alfredo Sicilia, Cal Humbert, Ruth Allen, Ed Dodd, and the other prospective teachers and staff to make the school ready for opening day. They lived in the dorm and enjoyed their meals at the Liberty Cafe. They especially loved the coconut cream pies the Jones served. That Fall, CMA successfully opened it’s doors to over 150 new students. 5. In 1964, Col Blankinship founded and became chairman of the board of Vardell Hall, a school for girls in Red Springs, NC. He became founder and chairman of the board for the Highlands School for Girls in Avon Park, Florida in 1966. In 1969 the Col resigned as president of CMA to accept the position of Director of the Jarvis School Bureau in Atlanta, GA.
6. The second president of CMA was the Reverend Harold D. Stanley, at that time minister of St Pauls Methodist Church in Maxton. Mr Stanley served until the close of the institution for financial reasons in May, 1972. 7. CMA enrolled boys from the seventh grade through high school with one year of post graduate work available for those who wanted or needed it. The curriculum included remedial reading, implemented by Mrs Elizabeth Blankinship, which helped many of the students to overcome poor reading habits resulting in an over-all improvement of their school work. This brought favorable attention to the new school and helped draw a student body numbering 200 at one time to the campus. 8. CMA functioned as a Junior ROTC unit with two former Army personnel coordinating the program. The system encouraged self-discipline, and students were challenged to qualify for positions of greater responsibility. 9. CMA was an associate member of the Southern Association of Independent Schools which is composed of private secondary schools in the southeastern U.S.
10. CMA was a member and Col Blankinship the president of the National Defense Cadet Corps (NDCC) which was composed of secondary military schools in the US. While a part of the NDCC, CMA was designated an “Honor National Defense Cadet Corps School” for the first three years of the school’s existence. The NDCC was subsumed by the National Association of Military Schools and Col Blankinship nominated for and elected president. 11. CMA was designated an “Honor Unit” within the Third US Army area which Col Blankinship said was “indicative of the exceptionally high standard of performance required of the Corps of Cadets”. 12. The cadet marching band under the leadership of Lt Fred Ferguson was especially noteworthy as it participated in numerous parades such as Mardi Gras and the Charlotte Carousel. The Royal Indigos dance orchestra was quite popular. Both received numerous accolades. 13. The cadet corps held Sunday afternoon parades which were open to the public. Many ended with the cadet corps marching down the main street of Maxton to the delight of the town’s citizens. 14. The track team was welcomed with an asphalt track to race on rather then the traditional old cinder tracks. For many years after the school closed, citizens of Maxton would use the old track to walk/jog on for exercise. 15. The military emphasis was removed from the program at CMA during its final year. Uniforms were done away with and girls were allowed to attend as day students during the final two years of the schools existence. 16. In its final years, the school was not able to attain a solid financial footing and upon the decision by the board of trustees, the school closed its doors on 27 May, 1972. 17. The Carolina Military Academy property was purchased by Carl Becham, who was most generous in allowing CMA’s librarian, Mrs Ruth Allen to affect a transfer of the library’s books to Onslow Academy in Jacksonville, NC. Onslow Academy is still active. 18. The main building and surrounding buildings at CMA caught fire and were destroyed on 7 November, 1973; just 9 days after Col Blankinship passed away. This story has been told to me by former Millersburg Military Institute Faculty & Cadets members as well CMA Faculty & Cadets. The story has stayed the same no matter the storyteller. When I got out of the Army in 1961, Colonel Blankinship contacted me to go to Millersburg Military Institute in Kentucky to teach and be a tactical officer. In December, the Colonel asked me about starting a military school in Maxton, N. C. I did not have any idea where Maxton was or what it was like. It turned out to be hot and flat. Colonel Blankinship, Ed Dodd, and myself packed up our belongings into a moving van, and in June, 1962, we moved to Maxton to start Carolina Military academy in the old Presbyterian Junior College building. We had no faculty and no students, but with much hard work, CMA opened in September, 1962, with a full house of cadets. The Colonel always encouraged faculty and students to do their very best. He was a true leader. He knew when to push and when to give a pat on the back. As with any good leader, he motivated all of us to do our best. The Colonel also had a sense of humor. One of the faculty, Jess Mercer, had a mustache. The Colonel persuaded the rest of the faculty, including his wife (who was a model of decorum) to sport a penciled-in mustache. When Mercer arrived at the meeting and saw everyone with a mustache, the look on his face was priceless. He enjoyed a good laugh with the others. Colonel Blankinship embodied all of the good things that Carolina Military Academy was about: duty, honor, and country. I am indebted to him for my success as an educator for 44 years, as he gave me my start. I learned much from my experiences under him at CMA, as did the many cadets entrusted to his guidance and leadership. The Colonel was a formidable man. Large in statue, intellect, and energy, he was also a man of persuasion and vision. It took a master salesman's enthusiasm, leadership, and sheer bravado to enlist supporters to part with huge sums of money and personal time in support of an ideal and to encourage them to send their sons to a new school to be located a hundred miles from anywhere more significant than a county seat. It was without doubt visionary to look beyond the ghost of Carolina College and the skeleton of Presbyterian Junior College and see with clarity the reality of Carolina Military Academy. While the eyes of this visionary could be stem, expectant, and unrelenting, they were also windows to a gentle soul that often dropped their gaze of those distant horizons to dance mischievously before the smile or the laughter hit his face. The Colonel was special to me. He was my first real employer after my graduation from college. He was a mentor who placed me under the tutorage of his dear wife thus assuring my success and making me confident in my career path. He was accessible and approachable, and I knew him to be fair and honest in all of his dealings with me. Most of all, the Colonel surrounded me with good people who had positive and profound influences upon my life and career and with good students—exceptional human beings--some of whom I count among my best friends today. Frank Lea used to come to Charleston a good bit. Once about 17 years ago he mentioned that "we" (Lea, Digger Lemacks, and Shark) should do something about having a CMA reunion. We talked about it a few times but nothing ever came about it. One year a few years later....we all met at Frank Lea's beach house along with Marshall Baker CMA'63. Lea gave out a few names for each of us to call....but no one ever called anyone as other things always kept us busy. Then it happened...lea promised to fund up to, I think, $20.00 in phone long distance charges if Tommy & I would do the phoning. Tommy came by my house one COLD Sunday morning & from there we opened my annual and "tried" to call the cadets using the home towns listed in the annual. We must have called 25--30 maybe more, cadets & never once got anyone! If I remember right....I did get one, Frank Sossamon. He wasn't home so I left a message. He doesn't remember that. In any event...we tried a second time and finally reached one guy...then another & another, etc. Each cadet knew how to reach an old friend or room mate & the chase was on. We were greatly encouraged as each cadet was extremely excited about our forthcoming reunion. We ended up with about 95 or so CMA boys & girls & teachers! Our first reunion was HUGE. Each one since has been smaller. While I don't think that we will ever get back to the big numbers of our first & second reunions...I would like to see us begin to grow our attendance by using class agents. These cadets would reach out to their particular classes & encourage them to "come home". Tommy "Digger" Le Macks was a big help in formulating a plan to put the reunion on. Every one that left that first reunion at Litchfield Beach left happy and looking forward to the next one. As my last year at MMI, (1962) was coming to an end, Colonel Blankenship our President asked to see me . He informed me that he was opening a new military school, Carolina Military Academy in Maxton, NC. He asked me along with about fourteen other cadets if we wound consider attending his new school . That Autumn I arrived at CMA . My first year there represented my fourth year in military school. My first three years were spent at MMI, in Millersburg Kentucky . The day that I arrived I was assigned to my room and introduced to my first roommate, Vernon Grooms . After I got settled I went over to the canteen . When I entered, Bill Caton and a few other cadets came forward, introduced themselves and welcomed me . I was taken aback, that was not the kind of reception that I received when I first arrived at MMI . As that first year progressed I experienced an entirely new academic atmosphere . The Corps of Cadets, as well as the Faculty all worked together to make our experience there a positive one . My year at CMA helped me to settle down from the MMI experience . Many of we cadets had academic problems as well as other negative issues, I was no different . During that Summer it was determined that my best course of action was to join the U.S. Marine Corps . I had found a new home and I owe my success there, in a large part, to my year at CMA . Carolina College was a Methodist college and preparatory school for women which operated in Maxton, North Carolina, from 1912 until 1926. In the fall of 1926, the school failed to reopen due to financial difficulties. Two main buildings and two domitories comprizing half the campus at the abandoned Carolina Military Academy in Maxton NC were razed by fire Wednesday night. Fireman received the call about 10:15 PM and on arrival found the gym, administration building and two domotories engulfed in flames. The Maxton fire chief Elbert Jones reported the fire was of undetermined origin. The campus was recently purchased at action for $154,000 by an Onslow County man, Carl Beacham. It had not been operative since 1971 when the academy closed. Prior to 1961, the buildings were part of Presbyterian Junior College which later closed to form St Andrews Presbyterian college in Laurinburg. Beacham, in the construction and real estate business to the Exchange in a phone interview that all buildings were lost except for one. Some time after midnight firemen were still attempting to keep cinders out of nearby trees. Jones said "I don't have any idea what started the fire, but it started inside the building. Maxton volunteer fireman Jim Willford said the fire almost spread to eight or ten trailers beyond the school. "The wind has been against us conciderably" he said. Fire companies from Pembroke and Laurinburg assisted. The Funiture in the building had been sold recently. The books in the library had been donated to a private school. Past President of the Junior College from 1938-1961, Louis LaMotte present at the fire which burned most of the night, remarked, "Well it's all gone." LaMotte, described by some as a man who had invested his life in the Presbyterian College, said "There were fellings of sadness in seing the campus go but it had started its delapidation long ago. It was right pitiful, " he said. The cap was falling off the dome and their were numerous incidents of vaddalism." LaMotte estimated the repairs on the campus would cost $50-100,000. The campus was built in 1910 as Carolina College sponsored by the Methodist????? no continuing page available. CONQUERING BLAZE - As the gymnasium and the administration building were attacked by flames Wednesday night the stately Corinthian columns retained their dignity until the last. The fire ate at the wooden columns and cunsumed them one by one while the inside of the structure was quickly qutted. Intense heat from the interior set the tall straight pillars on fire and they burned until they could no longer support their own weight and collapsed with a shower of sparks and burning debris.